or you can rate us on our facebook page. Last year (2018) I ordered several kinds of blackberry plants from Indiana Berry. They came promptly and were well packaged with clear instructions. The dormant bare root plants were large 2-year olds and took hold immediately. This was the third time I have ordered berries or asparagus from them and each experience has been very positive. On an order two years ago, the company replaced some plants that didn't break dormancy with no hassle. A very good company with excellent products. I forgot to send a review last year, so am doing so now when it's too cold to work in the garden. Hi, I had a issue with my credit card not going through last week. I fixed the issue and would like to place this new order if I can. I added some plants on my order. I am very impresseed with the quality of your raspberry canes and will continue to be a regular customer. I live in zone 4a in upstate NY. I am hoping to the canes in the ground soon. Thanks for the great looking canes! I ordered 100 strawberries (the Best Selling Collection) and a Potomac paw paw. You told me they would ship on April 12 and they were here on April 13. All were planted that afternoon and now it is raining the next day…perfect! The plants all looked great. I am not anxious to be a year older, but I am really looking forward to harvesting berries in 2019 and paw paws in a few years. Thank you for your great product and super prices. They were all nicely packaged with good planting information. I received the Anna Raspberries I ordered. Compliments to your staff. The plants are superb and the root systems are better than I have ever seen. That goes to show, If one is in the market for berry plants, you get them from the Indiana berry farm. The plants asked me to let you know they arrived in excellent condition with great packaging (great job) and really great directions. They will be settled in their new home over the weekend with the goal of eventually feeding 179 families as part of our community garden and food desert effort to feed healthy food to low income rural residents who don't have easy access to fresh food. If we find that we are able to get any grants we will certainly expand the small fruits garden and order from you folks again. We will be putting up a thank you sign to Indiana Berry once the plants get their feet settled so everyone knows who parented these guys into the world for us. Thank you so much! I just got my shipment of blackberry, raspberry and blueberry plants. They are healthy and bursting with life! Beautiful! They even threw in a bonus blueberry for me. Wow! I could not find where to write a review but I want to rate 5 out of 5. The plants you sent me were well packaged and arrived in a perfect shape. Well rooted, healthy and happy plants. Just unwrapped, soaked, and planted 12 well-endowed-with-roots white Primus and black Ben Sarek currants, with compost soil, and some nice mulch... These plants were awesome. I also pot-planted my 48 raspberries that were also well-rooted, especially the Anne yellow fall-producing, they are in my greenhouse. Aronia, bush cherry, now, in pots, I need tylenol! I highly recommend plants form Indiana Berry. Nicely packaged, good directions. I just ordered 75 for new patch have had very good luck with these best variety I have by far . Plant from Indiana Berry are the best great people to work with !!! When I placed this order I told you we had recently ordered the same variety from a different company and most of them had died. Well, every one of your plants leafed out. I would have let you know sooner but I've been busy snipping off blossoms and runners! Thanks for sending healthy, vigorous plants! I just wanted to send a note about the raspberry plants I bought from you last spring. I have been growing fruit for thirty years and somehow your company has slipped by me for all this time, and that amazes me. But I'm glad I found you last year when I wanted to start again with some raspberries. I bought a few Boyne plants and they produced awesome fruit for several weeks and multiplied very well. I think your plant guide is great also, and I referred to it many times since. Today I got your 2014 Guide. Thanks for the great plants.
" have been gardening for the last 45 years and of that have ordered from several companies online for hard to find plants for my area. I received my order of LIVE plants in pots (not DORMANT STICKS) FROM INDIANA BERRY I was shocked by how big and beautiful the raspberries, blackberries cranberries etc were. There were only a few leaves that were either curled of lightly wilted. ( i get more than that when i don’t water regularly. A lot of companies claim the plants are gallon size but it is a tiny plant in a gallon bucket, these plants were at least 2-3 feet tall and several clumps, not just one, I will hope that I can go visit their center or check out next fall what is available. thanks for being the first company completely honest and fast delivery c.battey"
And I also greatly appreciate your minimal-yet-appropriate packaging! The competitors shipped me the plastic gallon container – which I now have to reuse/recycle/throw away – whereas I assume you keep yours to reuse! …saving money and environment! I loved your simple, practical, functional, plastic bag only on the root ball – so the root ball stays moist and contained, yet leaves and stems don’t get moldy! Duh! Additionally their box was full of packing peanuts which is unnecessary, adds costs, not environmentally friendly, and made a MESS when I took their plants out of their box – especially since the root balls were not contained so there was dirt everywhere too! Feel free to use these statements (or a slightly edited more polite version) in your marketing & promo materials! I will be a repeat customer! You are definite pros! This was my first experience with Indiana Berry. I ordered blackberries, some elderberries and strawberries. Plants arrived on time, but the packing was a bit below standard. Although individual plants were well packed, the box was half empty, with no packing materials added. Elderberries and blackberries were in good shape. The strawberries were well packed, but were not of uniform quality. About 20% were quite small, and in my mind, qualified as “seconds”. I would generally recommend them, but would use another company for strawberries. I don’t think I’ve ever received a shipping confirmation after the plants arrived and were planted in the ground. Absolutely amazing service. You are the best!!! Thank you. 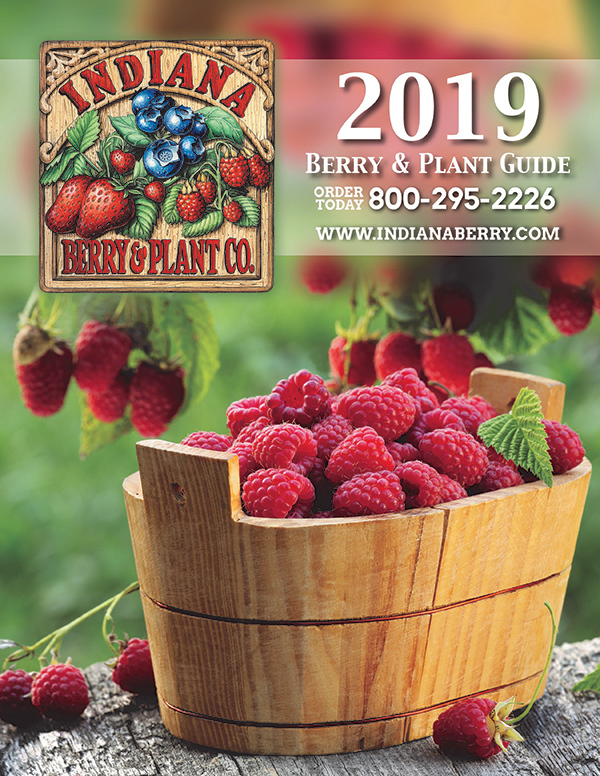 I've been gardening and ordering seeds and plants for more than half a century, and this year was the first time I ever ordered from Indiana Berry. The three types of bare root berry plants I ordered were very healthy, with vigorous roots, and delivered on schedule. I was impressed enough that I turned around and ordered grapevines. 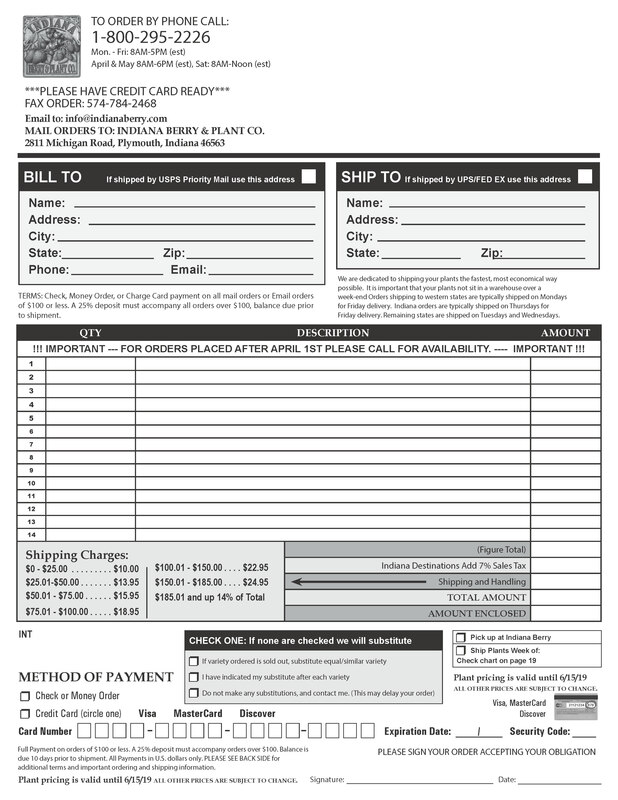 Before I placed my first order with Indiana Berry, I had ordered asparagus plants from another well known vendor, but that company failed to deliver. After several delays, I cancelled that order, and ordered my asparagus from Indiana. I'm not a big customer, but they treated me like I was their only customer. Great products and customer service. Out of 100 strawberry plants, 3 grape, and 1 rhubarb, everything we bought is growing. The plants are going great so far. Will order again.